Just as I was feeling nostalgic about cherry blossoms from La Carmina’s recent post about hanami, I came across an interesting piece of science news. Some trees grown from cherry stones that were taken up into orbit came into bloom this year, which is about six years earlier than expected. There’s more to the story though. Back in 2008, students collected stones from cherry trees from fourteen places in Japan. One of the trees was the famous Chujo-hime Seigan sakura tree. According to legend, Chujo-hime was a princess who was left to die in the mountains by her stepmother. Buddhist nuns rescued her, but she became ill one day. She prayed to Kannon at Ganjou Temple and soon recovered. As thanks, she planted the tree that became the Chujo-hime Seigan sakura tree. The real one is said to be 1,250 years old, and not once has a stone from it sprouted before. However, when the International Space Station commander Koichi Wakata returned with the stones, a handful that were planted at Ganjou Temple. This year, one has not only sprouted, but also bloomed. To add to the strangeness, the nine flowers had five petals each, instead of the expected thirty. None of the articles I read specified the species of sakura, but there are some that do have over twenty petal per flower. I’m more used to the ones with five petals because that’s what I saw in Japan. 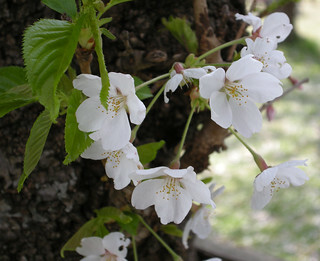 Three other locations have produced blossoms, and one tree in Hokuto bloomed two years ago. Cross-pollination is a possible explanation for this anomaly. Some researchers suggest it was the influence of cosmic rays that altered the appearance and growth. Unfortunately there was no control group so no conclusions can be drawn. It does open doors for biological and astrological research. A couple weeks ago at work, an issue of the science journal Cell caught my eye. The artwork is by illustrator Yuki Takahashi, based on a design by Kentaro Hirose (who I think is a circadian biologist based on what I gleaned from his Twitter). The cover was a lot more vibrant than I’m used to. At first, it looks like there are two girls in kimono pushing the hand of a clock. Upon closer inspection, their hair accessories are actually cartoon representations of proteins, FBXL3 and FBXL21, that regulate cryptochrome proteins CRY 1 and 2. These are involved in regulating circadian rhythms. Like a clip with hair extensions at the end, FBXL3 and FBXL21 alter CRY1 and 2 by adding a chain of ubiquitin molecules, symbolized by the UB, to signal either the degradation of CRY1 and 2 (thus speeding up the organism’s internal clock) or the stabilization of the proteins (thus slowing down the clock). It’s this back and forth that maintains an organism’s circadian rhythm. One of the cover stories comes from Arisa Hirano from the University of Tokyo. Her journal article, “FBXL21 Regulates Oscillation of the Circadian Clock through Ubiquitination and Stabilization of Cryptochromes”, talks about what I described in the previous paragraph. Although it focuses on FBXL21, the article does mention that the protein opposes the action of FBXL3. The other article hails from my workplace, UT Southwestern Medical Center. The author, Seung-Hee Yoo, actually belongs in my department, Neuroscience, which is headed by one of the paper’s contributors, Joe Takahashi. “Competing E3 Ubiquitin Ligases Govern Circadian Periodicity by Degradation of CRY in Nucleus and Cytoplasm” also studies FBXL21’s role in regulating the circadian clock in mammals, focusing on the process of ubiquitination. 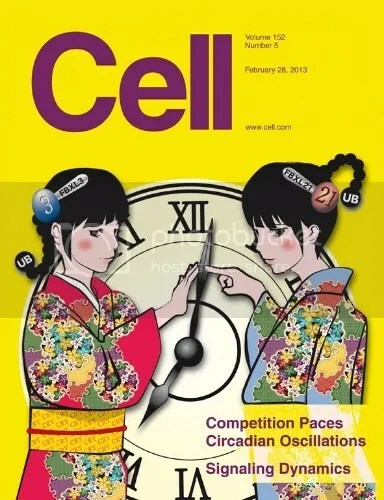 In short, the Cell cover was a very well thought-out illustration. There’s a lot of cool science out there, and it’s cool that art can help bring attention to some of those discoveries. I was going to write up my Grassroots Summit post, but earlier this week, some exciting news came in the form of the Nobel Prize in Physiology or Medicine. Sir John B. Gurdon and Dr. Shinya Yamanaka received this year’s prize for their discovery of a specialized cell’s ability to be reprogrammed into an immature state that allows it to develop into different tissues. This concept, known as pluripotency, is a major component in stem cell research. Sir Gurdon is a developmental biologist at Cambridge (where he has an institute named after him). When he was at Oxford in 1962, he replaced the nucleus of a frog egg cell with one from a tadpole’s intestinal cell. The egg developed into a cloned tadpole. Even though the intestinal cell was mature (meaning that it developed specialized functions), the D.N.A. in the nucleus still contained information needed for an egg to develop into a tadpole. Prior to his discovery, biologists believed that mature cells could not go back to their pluripotent state and become other types of cells. Forty years later, Dr. Yamanaka of Kyoto University took Sir Gurdon’s research a step further by studying genes that kept a cell in the immature pluripotent state. He introduced these genes into mature tissue cells, and he found that a combination of four of them reversed the cells’ state. His lab created what is known as induced pluripotent stem cells. These cells could be the alternative to stem cells from embryos for research and therapeutic purposes. Dr. Yamanaka has won many awards including for his research, including the 2010 Balzan Prize and the 2012 Millennium Technology Prize. Time Magazine also deemed him a “Person Who Mattered” in its 2007 Person of the Year issue. He is the director of the Center for iPS Research and Application at Kyoto University and runs marathons in his spare time. Congratulations to both Sir Gurdon and Dr. Yamanaka! For more info on their contributions, check out the official press release. You’ve probably seen this in recent news: a group of Japanese scientists have engineered bacteria that can solve a 4×4 grid version of Sudoku. What most of the on-line articles don’t mention is that this group consisted of undergraduate students from the University of Tokyo. This project was their entry in the International Genetically Engineered Machine (iGEM) competition, which challenges to students to make biological systems that operate inside living cells. Escherichia coli can adopt unique characteristics through mutation or incorporation of genetic material from another organism (the existence of different strains is why E.coli can both harmlessly live in your intestine and give you food poisoning). The UT-Tokyo team engineered 16 different strains of E.coli that produce colonies of 4 possible colors; these colors, which are the result of fluorescent proteins being produced, are the equivalent to the numbers 1-4 on a 4×4 Sudoku grid. The following clip explains the biochemistry behind making the Sudoku-solving E.coli. Confused by all the jargon? Let me try to explain with an analogy. Each of the 16 strains has DNA that codes for all of the 4 fluorescent proteins that express red, yellow, green, or blue. This is the equivalent of how each square in a 4×4 puzzle can be any of number from 1-4. However, Suduoku puzzles already have some of the numbers written in. Likewise, the team has prepared a few E.coli strains that already express a single color (they’re known as being differentiated). These bacteria send out signals in the form of enzymes called RNA recombinases that tell the nearby undifferentiated bacteria what color protein they can NOT produce. This is done through viruses that have been engineered into the differentiated E.coli. The team collects the virus and uses them to infect the “detection” E.coli. The RNA recombinases are like the rules of Sudoku, and the detection E.coli are like the answers you write in (versus the supplied answers/differentiated E.coli. When you’re solving Sudoku, you see the pre-assigned numbers and known that the rules prohibit the other boxes in the same grid, row, and column to be that number. The viruses infect the detection bacteria on plate, sending the RNA recombinases to do their job. The enzymes cut out the portion of the RNA “message” for three of the proteins coded by the DNA (basic biology lesson: DNA codes RNA, which codes protein that is expressed by the organism). Think of this as a process of elimination. Once the message for three of proteins have been removed, there is another message that tells the bacteria to express the remaining fluorescent protein. This happens right before your eyes, as different colored E.coli colonies grow on a plate that has the 4×4 grid mapped out.